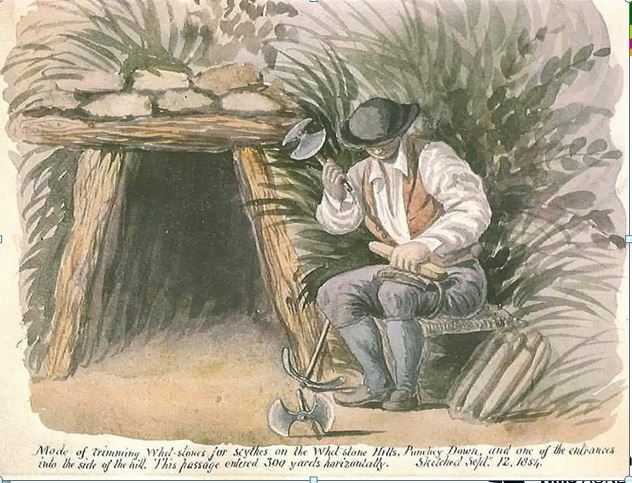 Whetstones, used for sharpening tools, were mined in the Blackdown Hills from the 17th to the 19th century, from Uffculme in the north to Hembury in the south. The Blackdown Hills was the source of a very high-quality, durable whetstone, called the Devonshire Batt. The stones were originally picked up by local farmers from the narrow channels formed at the heads of streams. Mining and manufacture of the shaped Batts for sale seems to have begun in the late 17th century and was certainly well established by the 1750s. The mines were driven horizontally into the hillside for anything up to 400 yards to where seems of the whetstone rocks were discoverable. The tunnels were five to six feet wide at the entrance but were widened further inside to allow two men with wheelbarrows to pass each other. The white spoil heaps from these mines were so close together on the hillside that they were visible as a near continuous whitish stripe along the face of the hill. When the whetstone seems were exhausted the mines were simply left to collapse. Once the raw material was mined – in lumps the size of a horse’s head – it was roughly cut into long blocks using a special hand-tool. The rough-cut pieces were then shaped and smoothed, usually by the wives and daughters of the miners’ families. Anything up to 10,000 stones a week were produced in peak demand, most sold on to wholesalers and shipped to distributors elsewhere in England and Wales. The miners and their families could live reasonably well on the profits from sales of their whetstones, earning up to three times the wage of an agricultural labourer. As such, leases on the mines tended to remain with families. 1841 there were an estimated seventy miners working in Blackborough and Kentisbeare, although this number fell quite considerably from the 1870s onwards. Although whetstone mining paid well, the work was not conducive to good health. Chalk dust inside the tunnels and the ‘smeech’ – a fine dust arising from shaping the stones – made sure that the miners lives were cut short by lung disease, including consumption, gangrene of the lungs and tuberculosis. Of the 151 miners recorded over five censuses, only four (2.6%) had made it over 60 years of age, and nineteen (12.5%) to over 50 years. Descendants of whetstone miners’ families still exist around the Blackdowns, and the remains of the old pits are still visible along the footpath running above the village at Blackborough.